Hey Everyone, A quick shout out to remind all my friends in Aspen about the AJAX Cup next week. The Ajax Cup coming this December 30th is an extraordinary fundraising event featuring a one-of-a-kind ski race down Aspen Mountain between teams led by some of the most famous ski athletes in the nation. The two-day event will raise funds for Aspen Valley Ski and Snowboard Club’s programs and scholarships. The winning team has their names engraved on the Ajax Cup, a unique trophy designed by Gorsuch, Ltd. 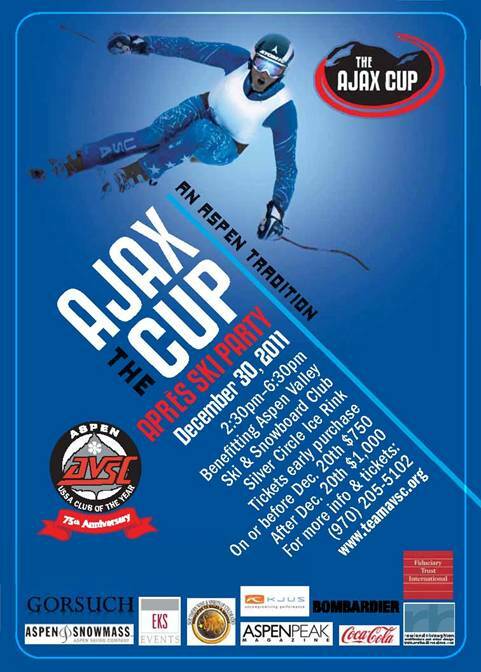 The Ajax Cup Aprés-Ski is the event of the season in Aspen. Celebrity hosts celebrate the Ajax Cup winners and guests with gourmet food, top-shelf libations and live entertainment. The event takes place from 2:30 – 6:30 p.m. at the Silver Circle Ice Arena Tent just steps away from Gondola Plaza in downtown Aspen. Tickets are $750 per person and can be purchased here. For information and team sales please contact Barbara Frank at bfrank@teamavsc.org or (970) 205-5102.